I’ve been curious about Per Petterson, who almost shares my surname, since I noticed his novels on the shelf when I first started work at Readings. Six years later, and having just read his latest novel, I Refuse, I can finally say my curiosity is satisfied. My only regret is that it has taken me so long to get around to reading him! In 1990, Petterson lost both of his parents, a younger brother and a niece in the Scandinavian Star ferry disaster. Loss and fragmentation of family are themes often explored in his novels and I Refuse is no different. The story opens with Tommy and Jim meeting by chance, not having seen each other for 35 years. As boys they were the best of friends. Although very different, they share a history that has shaped both of their lives. Both were raised by single parents and Petterson, amusingly, writes that as small boys, they ‘had thought it was a creative idea to have two’. Tommy’s family is split further after a particularly violent episode causes his father to disappear without trace. Other crises lead Jim to try to take his own life and he ends up in a psychiatric ward for a time. The story travels back and forth – between past and present, from Tommy to Jim – with the odd chapter written from the point of view of another character. As in real life, there isn’t a tidy structure or ending to this story. Many things are hinted at, people come and go from one another’s lives and many things remain unresolved. 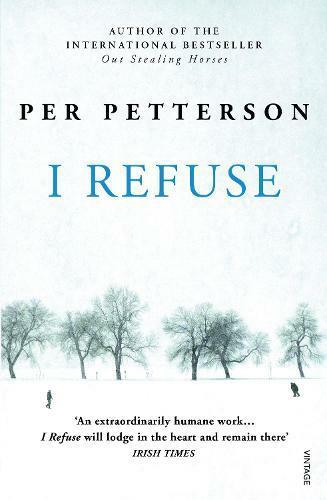 However, Petterson’s writing is so simply beautiful that we don’t mind the lack of conclusion – we’re happy just to have been part of the journey.